Pre heat oven to 200 c. Heat a saucepan big enough to hold all the ingredients. pour in a splash of olive oil. Season the chicken with sea salt & pepper and brown them gently. thinly slice the garlic and add to the pan. Add the wine, a dash of water and turn the heat down. simmer gently until the chicken is cooked through and the wine has reduced a little. Meanwhile cook the spaghetti in salted boiling water, follow packet instructions. Add the cream to the pan of chicken, then bring to the boil and turn the heat off. Season well with salt and freshly ground pepper. 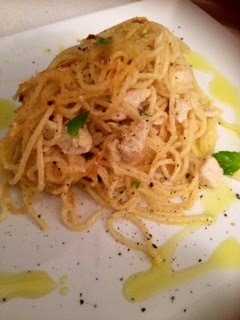 Add the drained spaghetti to the creamy chicken sauce and toss well. (Add sautéed mushrooms here if like) . 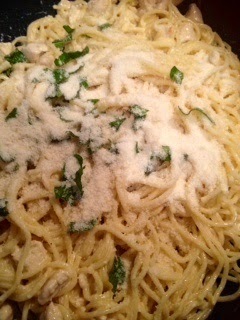 Add 3/4 of the parmesan cheese, all of the basil and stir well.